Tragic news coming to our house this morning as our brother-in-law Joery reports that six people drowned yesterday afternoon at Parola Wharf in Iloilo. According to Philippine Coast Guard, the M/B Tawash, bound for Jordan in Guimaras, had just left Parola Wharf in Iloilo City yesterday afternoon around 4 pm when it capsized due to strong winds and powerful waves. My wife and I have been on the Tawash dozens of times in the past six years and personally know the captain and owner of the Tawash, Larry. 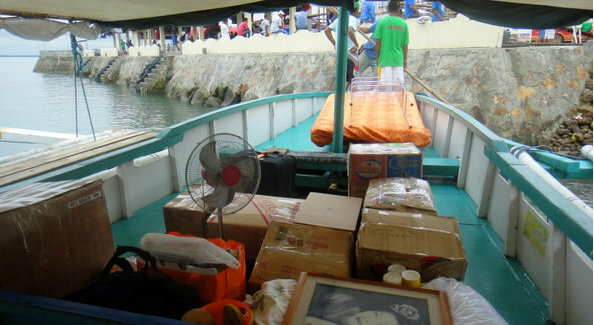 Larry and his crew moved us from Guimaras to Iloilo several years ago. I certainly would have been among the dead if we had been on that boat yesterday. I cannot swim at all. We have not been required to wear lifejackets for years on any of the pump boats. I don’t even think a life jacket would have saved my life. Initial information from authorities revealed that there were 33 passengers on board the boat. As of posting, 23 have already been rescued at the time ABS-CBN reported this story. But my brother-in-law reports that six people are confirmed dead. A tarp that covers the vessel had collapsed and trapped passengers who were unable to swim back to the boat. Search and rescue operations for the remaining passengers are ongoing. Sea vessels were not allowed to travel Sunday morning due to a gale warning raised over Iloilo but they were allowed to leave ports by 12:30 p.m. once the warning was lifted. I don’t know why the boats were allowed to leave. We had tremendous winds all day yesterday in Guimaras. PAGASA has warned against sea travel over the seaboard of Luzon and Visayas due to risky conditions. The craft, which was headed for Jordan, Guimaras, was just five minutes off the terminal when it capsized after being hit by strong winds, Office of Civil Defense Region 6 (Western Visayas) director Rosario Cabrera said. The boat was carrying 31 passengers and eight crewmen during the time of the mishap. Responding Coast Guard units immediately pulled out of the water 33 survivors. Larry was our friend, a devout Mormon with five daughters. An extremely friendly man, always smiling. My wife went to school with him. As far as we can determine at this point, the crew member listed as dead, is Larry. This information has been collaborated, however, not officially, by other sources. I will post more updates on this story as more details become available. I have to be really careful with my comments here, as we don’t know all of the facts. But how many people are going to have to die in boating accidents in the Philippines before the people and the government wake up!!??? How many times are boats and other vessels going to be allowed to leave ports, any ports, during bad weather before these people wake up. I could tell you a story about the ship sinking in June of 2008 (I think that was the year) and hundreds died. But I will not tell it now. But the attitudes of three filipino women I met in Japan were ridiculous.. The Bahala Na attitude filipinos have at times is maddening. Todd, the violations that are allowed at our port in Guimaras, Jordan, and the ports in Iloilo, Ortiz and Parola are frightening. I have become so complacent these past several years and stupidly never wear a life jacket. I can’t swim. I can’t even float. The local Coast Guard shows up occasionally but at NO TIME IN THE PAST FIVE YEARS have I ever seen any pump boat crew demand that everyone wear life jackets. When I first arrived here six years ago, life jackets were mandatory. It’s the same mindset that allows the majority of the motorcyclists on Guimaras to go without wearing helmets and allows jeepneys to pack the TOP OF THEIR VEHICLES with students. All in the name of making an extra peso. And all in violation of existing laws which are not enforced. Word in Guimaras, where we haven’t seen a LTO, Land Transportation Office, checkpoint in a year, is that the LTO was threatened with physical violence on Guimaras. Can’t verify that, but that’s what I’ve heard from the locals. You know I really love the Philippines, but sometimes I just don’t understand what people are thinking there. I just don’t get it. Were those people in such a a HUGE hurry that they just had to get in a boat during a serious storm and bad waters? Probably not. But they don’t seem to really care. Just puzzles me. And where is the government regulations and especially the enforcement of the regulations if any? Just gets me so frustrated at times. In June of 2008 there was a major ferry accident in the Philippines. A ferry with hundreds on board was allowed to sail during really bad weather. It capsized and hundreds were killed. I then told them that in most countries that ferry would have NEVER been allowed to sail…and that the captain of the ship, the shipping company owners, and the Coast Guard would be in severe trouble in most of other countries. Their response: “Well, no one should get in trouble. They didn’t sink the ship on purpose.” I almost fell off the bench I was sitting on. Other people that heard the conversation were STUNNED. But we ALL know that many filipinos have that attitude. It is the same attitude that has people make NO preparations and refuse to evacuate when they KNOW HUGE typhoons are headed their way. I guess God is going to save them all. Really frustrates me. Ok, I am off my soapbox…but I really care about filipinos and it drives me crazy. This one really hits close to home, Todd. The captain/operator of the Tawash, the boat that capsized, made the decision to return to Guimaras. I’ve been told that he was anxious to get home. Larry always greeted me and called me his “amigo.” I’m sure his wife and five daughters will miss him. Larry, no doubt, probably died trying to save the passengers he put at risk. He was a devout Mormon and I’m hoping that there will be funeral services for him that I can attend. But the attitude you described among the three Filipinas is quite common here. There is no danger of anyone being sued or faced with any major fines over this incident. No one will point the finger at anyone though I cannot understand why in the world Larry’s boat was allowed to leave. 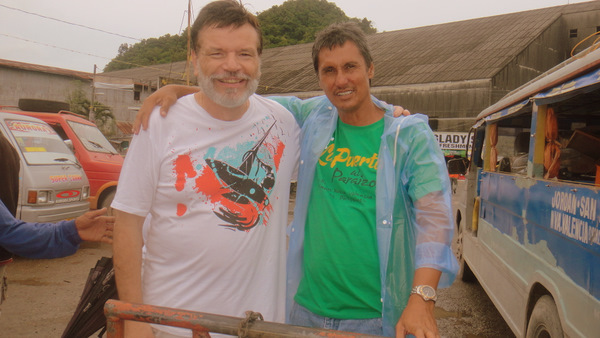 We had major winds and a torrential downpour in Guimaras hitting us at the time the boat capsized. I really am sorry for the loss of your friend and the other people that lost their lives and family members. I truly hope that in your area, every area actually, that people start to take things much more seriously there. Allowing ships to sail in bad weather, unless they are military ships (and even those types of ships use extreme caution at times)should not be allowed. It just saddens me so much. Thanks, Todd. Larry was a good guy. I’ll miss him. I, too, am saddened by those others that lost their lives, two of them children. I have to tell you that we will be making less trips to Iloilo in the future. I sincerely believe that I would have perished if we had been on that pump boat. The time it left the dock in Iloilo, 4 pm, is the time we usually leave. My wife is a good swimmer but I’m sure she would have tried to save me if we had been on that boat. Guess it wasn’t my time yet. I hope that some changes are made, Todd, but after living in the Philippines for over six years, I doubt that anything will really change. Hopefully people will be more aware and use caution. I can only pray they do. Well here is what I would do. I would take my own life jacket… a truly good life jacket. It would save your life. I would then find a place to put it at the dock, or wherever, when you get to your destination so you can retrieve it on the trip home. This is something I rant about all the time…EVERY single person that has drowned has wished they had a life jacket. So what if they don’t look cool? They save lives. So Dave, the next time you and your wonderful wife (or anyone you are with) heads to Iloilo then wear a good life jacket or have it within arms reach. They save lives and the good ones can save the life of people that swim like rocks. There are life jackets hanging up on each pump boat, Todd. But as to their seaworthiness, I don’t know. We could buy a couple of good life jackets and put them in our truck. 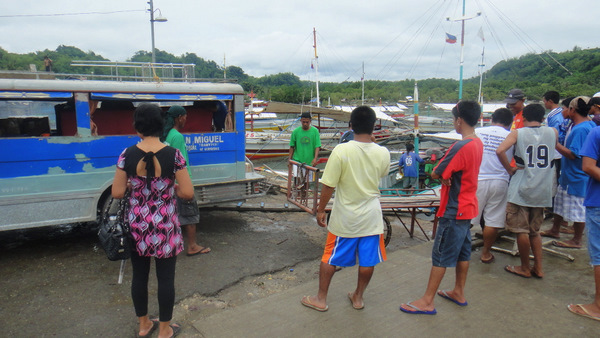 We drive the truck to the Jordan Wharf in Guimaras where we catch the pump boat to Iloilo. We could always check them at SM City or some other establishment we hang out at. Such a sad tragedy! Sorry to hear about the loss of your friend. Can’t remember if we rode that boat going over to Guimarus before. There is no reason that boat should have traveled in that weather. Money trumps safety in many things here in the Philippines. That Laissez Faire attitude keeps this country from advancing. Be careful coming over next month, Papa Duck. Unfortunately, as you well know, money does trump safety in the Philippines as you noted. Sadly,I don’t know if that attitude will ever change. Thanks, Pantera. Larry was a super good guy. My wife knew him from her high school days and when she first spotted him thought to herself that this guy is really handsome. Larry had a winning smile and great attitude. We will surely miss him. Dave, my condolences on the loss of your friend. Good idea for you and your family to wear life jackets whenever you take the pump boat even if no one else does, because everybody will be scrambling for them in an emergency and you might not get one. Better safe than sorry. Thanks, Lance. There are life jackets for all the passengers on each boat, but as I remarked to Todd, I don’t what kind of shape they are in. I can guarantee you that we will not be traveling during any bad weather in the future. The typhoon is not expected to leave the Philippines until this weekend and we are staying put. Once again sorry about your friend looked a nice guy, Derek in pasig. Glad you’re feeling better, Derek. Well, yes, everyone will just shrug this off and nothing of substance, as far as enforcing the current laws on the books, will be done. Anyone that’s lived in the Philippines for any amount of time recognizes that. I can beat my chest and complain, but to no avail. It’s a tragedy and I’m going to miss my friend Larry. I posted several comments on FB about this. In over six years of living in the Philippines, Jim, I have never seen, and probably never will, seen any emergency drills for pump boats. That would cut down the number of runs the pump boat operators could make that day. Heaven forbid they lose a few pesos in order to try and save lives. Passenger manifests are incomplete, the life jackets available are old, and people are not generally concerned with safety here. It’s all about chasing the peso. Life jackets are of no use if not worn properly. Has anyone seen a person wear one properly, with all the buckles fastened and it fitted properly? Most life jackets are in various levels of disrepair, from missing buckles and straps to rips in the material. It appears they are of several manufactures which would cause more confusion. On that windy day, the boats should have been shut down. There was no excuse for this to happen. I refuse to ride the boats on very windy days, even if they are running. As far as the lifejackets, I always take it off as soon as I can because, as I said earlier, they are useless until fitted properly and because of the condition of the life jackets, most can’t be fitted properly. Plus, from my 20 years of sailing experience, the life-jackets given, even if used properly, are poorly designed and only give a non swimmer marginal safety in the event of a capsize or sinking. But as I said earlier, they must be worn properly and no one does. I agree, Jim, the boats had no business running that day…period. The winds were extremely strong all day.